Another great ACCU Conference passes, and with it the usual mix of informative and entertaining sessions, great networking, barhopping, and far too much food and (real!) beer. As ever the schedule was varied, the sessions interesting (for example we attended one on writing Jenkins plug-ins, which is obviously very relevant to Visual Lint Build Server) and entertaining (Tim Lister's bonus lightning talk on "Software projects are hurricanes", or Alan Kelley's passionate rant on software rewrites. It goes without saying that the company was as fun and inspiring as ever. We learnt a bit more about C++ 11 (my copy of the second edition of "The C++ Standard Library is now resting on my desk alongside Anthony Williams' recently arrived "C++ Concurrency in Action" and Allan Kelley's "Business Patterns for Software Developers"...), a lot about other stuff and generally put the world to rights, using Twitter as our medium, and beer as our lubrication. There was even a little free pizza and beer floating around - the latter notably during Olve Maudal's "C++ 11 Pub Quiz" which was (rather appropriately) held in the hotel bar. On Wednesday evening I took the plunge and did my first lightning talk, entitled "Don't let the Big Ball of Mud sneak Up on you". Talking to a room of 400 people with a microphone and a 5 minute deadline is an interesting place to be in, but it was great fun and I'd heartily recommend it if you fancy trying your hand at speaking. Skillsmatter filmed some of the sessions, so video should be online soon - as will slides from the presenters themselves. Next up for us should be Agile on the Beach in Falmouth this September. Fixed a bug which caused retail builds of ResOrg 2.0.1.16 to erroneously expire 90 days after the build date. When a ResOrgApp floating toolwindow is shown a check is now performed to ensure that its position is within the visible area of the desktop. If not, the window is moved to the centre of the main window before being shown. PC-lint project indirect (project.lnt) files are no longer generated for projects which are excluded from analysis. Fixed a bug in the display of code editor markers in Visual Studio 2008 and earlier. The bug manifested when an unusually small code editor font size was used [Visual Lint Enterprise Edition]. Fixed a bug in the display of code editor marker tooltip text in Visual Studio 2010 [Visual Lint Enterprise Edition]. Fixed a regression in the detection of modified files within Eclipse. The bug affected files included in a project as linked resources, but not those located within the project source tree. Visual Lint commands will now be disabled whilst the Visual Lint plug-in is unloaded within Visual Studio 2005 and 2008. This prevents the plug-in from being unexpectedly loaded as a result of one of the commands on the toolbar being inadvertantly activated. The "Echo raw analysis results to the Output Window" option on the Display page in the Options Dialog now defaults to "Off". Modified the manual analysis process to avoid unnecessary display updates when analysing files containing a large volume of analysis results. Modified VisualLintConsole for improved efficency when analysing codebase containing a large volume of analysis results. When a trial installation of VisualLintConsole is run in a non-interactive environment, it will now automatically switch the active product edition to Visual Lint Build Server Edition. Fixed a bug in VisualLintConsole which could cause the wrong analysis tool to be reported in the console window when started with the /toolname option. 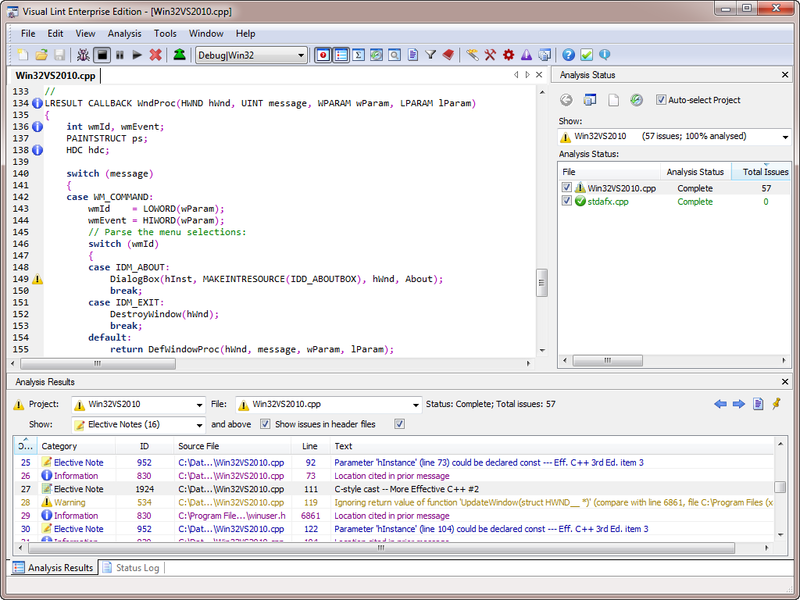 The Ctrl+C keyboard accelerator is now supported within the Visual Lint displays when running within the Eclipse IDE. The "Raw Analysis Results" view in the Analysis Results Display now supports the Ctrl+A and Ctrl+C keyboard accelerators. Corrected a pair of transposed commands on the Analysis Results Display context menu.